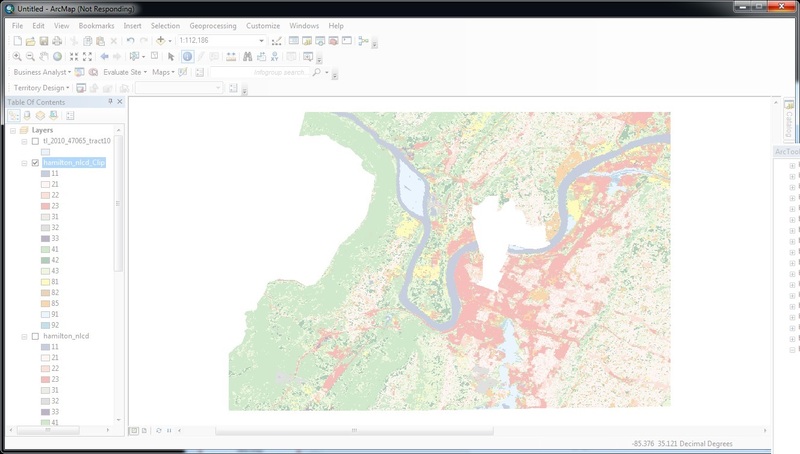 Concepts and methods of spatial analysis and their application using geographic information systems software and techniques. Emphasizes both theoretical and applied aspects of GIS. Contact Hour Distribution: 2 hours lecture and 2 hours lab. I recently ran a model of Hemlock on my personal computer. I modeled ~489 records; the Nautilus model used over 2,000. This is a representation of the Maxent model for Tsuga_canadensis. Warmer colors show areas with better predicted conditions. White dots show the presence locations used for training, while violet dots show test locations. This is not really a fair comparison, but the difference between the models with 489 records and 2000+ is interesting for comparing the predictions. EECS model for Eastern hemlock is different. It uses more data, and it was run 20 times with 10% of the records reserved before being synthesized into one image. I will post some additional comparisons for other trees in some later posts. Geography 414 homework assignment from the Raster database lecture. My approach to this is to create a new shapefile that does not contain the census tracts to exclude. I’m not sure why 10 and 15 were listed as tracts and will need to ask Dr. Ralston about that in class – perhaps I am looking at the wrong attributes. In some metadata I found at http://datafinder.org/metadata/Census2010Tiger.html <TRACTCE10>, "TRACTCE10" is listed as "2010 Census census tract code"
Also, "NAME10" is defined as "2010 Census Tract Name" – this is the census tract code converted to an integer or integer plus two-digit decimal. Still, however, 10 and 15 were not listed as tracts when sorting by ascending in "NAME10" column in the preview in ArcCatalog. I chose "Switch Selection" and then "Create Layer from Selected Features" to obtain a new layer, minus tracts 6, 8, and 31. I then used Raster processing – Clip following the guide at <http://blogs.esri.com/esri/arcgis/2009/05/14/better-raster-clipping-options-in-arcgis-part-b/>. I used <hamilton_nlcd> clipped previously as the input raster. The output raster is <tl_2010_47065_tract10 selection>. As a final insult – ArcMap froze up on me – so my final product is faded out, but I took a screen capture with Print Screen. Text and PDF materials: The GIS Guide to Public Domain Data, Kerski, Joseph and Jill Clark Designing Geodatabases, Arctur, David and Michael Zeiler Several pdfs and other documents made available during the semester through Blackboard. We will also use several tutorials available from ESRI. These are available as PDF files on the computers in 206 and 404. You will be expected to copy the PDFs and tutorial data to your own CD or USB drive or computer. I have order copies of ArcGIS for all students. These copies are good for one year after you register them with ESRI. The main topics for this course are the role of public domain data, sources of spatial data for the Tennessee, the United States, and the world, methods of data capture, entry and editing, linear referencing and dynamic segmentation, the importance and use of metadata, legal aspects of spatial data, some theories of spatial database systems, geodatabase design and implementation, free and open source alternatives to commercial software, and management of spatial data in a multi-user environment. The goal is to give you the kinds of knowledge and skills you will need in the workplace or in your own research. Discussions with past graduates of our program have indicated that these topics are extremely valuable. This will be a very “hands-on” class in which you will work with several software packages including Global Mapper, ArcGIS, SQLServer, PostgreSQL and PostGIS., and some software written by the instructor. Grades will be based on homework assignments (30%), a midterm exam (35%) and a final exam (35%). The schedule below is a rough guide. If necessary, we may expand or contract some of the topics. I am working to arrange some guest speakers and a possible field trip to beautiful downtown Knoxville. Data Capture and Geometry Lab: ArcScan and ArcEdit Crowd Sourcing and Data Portals Chapters 5 and 8 (KC) Midterm Exam is scheduled for Friday, October 11.